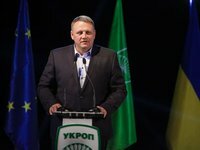 The Ukrainian Association of Patriots (UKROP) party has officially named MP Oleksandr Shevchenko who does not belong to any faction in the parliament its candidate for the presidential elections in Ukraine that are scheduled for March 2018, Yevhenia Kravchuk, head of the party's press service, said. "The UKROP party has officially nominated MP Oleksandr Shevchenko as its candidate to run for president of Ukraine in the elections in March 2019. A respective decision was made by the party at its 16th assembly, which is taking place today at the Kyiv International Exhibition Center," Kravchuk wrote on Facebook on December 5. She said Shevchenko was given the right to run for president "after his victory in the primaries within the party." "The MP has received the support of members of the Ukrainian Association of Patriots in 24 regions of Ukraine," Kravchuk said. Earlier on December 5, Borys Filatov, mayor of Dnipro, announced that he submitted a letter of resignation to discontinue his membership of the UKROP party. "Starting from today, I am abdicating my duties as a member of the board of the political council of UKROP and leaving the party," Filatov wrote on Facebook.